If you want to communicate with someone from across the globe who speaks a different language, all you have to do is laugh. Laughter is a form of communication that’s universally recognized, which suggests it has deep importance to humankind. It's thought that laughter may have occurred before humans could speak as a playful way for mothers and infants to communicate, as a form of play vocalization, or to strengthen group bonds. Even today our brains are wired to prime us to smile or laugh when we hear others laughing. Yet, laughter is a largely involuntary response; it’s not generally something you can force yourself to do. Instead, laughter is thought to be triggered by mechanisms in your brain and impacts breathing patterns, facial expressions, and even the muscles in your arms and legs. It plays a role in your health, too, and has many quirks and mysteries that make it one of the most fascinating physical reactions that a human (and certain other species) can make. Professor Sophie Scott, a neuroscientist and stand-up comic, put together these surprising facts about laughter. Rats laugh when they’re tickled, and the more they play together, the more they laugh. Psychologist Jack Panksepp first observed laughing rats in the 1990s; he needed special equipment to hear it, as rats’ laughs are very high pitched. If you're laughing, you're far more likely to be surrounded by others, according to research by laughter expert Dr. Robert Provine. The critical laughter trigger for most people is another person, not a joke or funny movie. After observing 1,200 people laughing in their natural environments, Dr. Provine and his team found that laughter followed jokes only about 10-20 percent of the time. Social laughter occurs 30 times more frequently than solitary laughter. In most cases, the laughter followed a banal comment or only slightly humorous one, which signals that the person is more important than the material in triggering laughter. 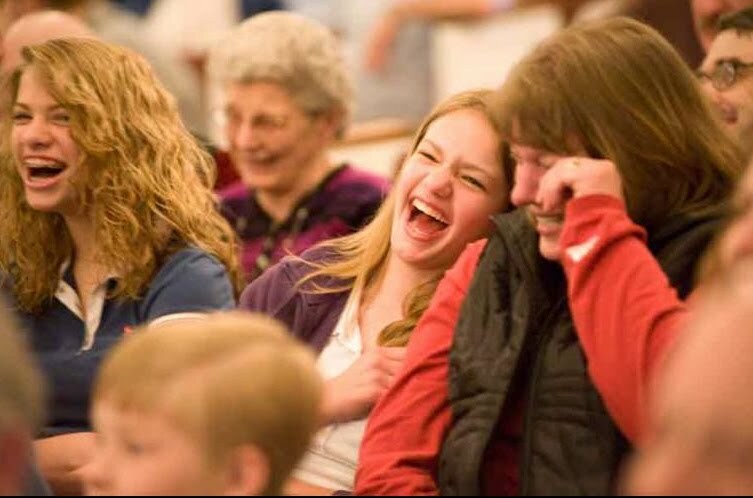 Professor Scott’s research has shown that your brain can tell the difference between real or staged laughter. When you hear staged, or deliberate, laughter, it prompts more activity in your brain’s anterior medial prefrontal cortex, which helps you understand other people’s emotions. This suggests your brain automatically goes to work deciphering why someone is deliberately laughing. The saying "laugh and the whole world laughs with you" is more than just an expression: laughter really is contagious. The sound of laughter triggers regions in the premotor cortical region of your brain, which is involved in moving your facial muscles to correspond with sound and prepare to join in. Familiarity is a key part of humor and laughter, and research shows people find jokes told by famous comedians to be funnier than the same joke told by someone they’re not familiar with. Laughing raises both your energy expenditure and heart rate by about 10 percent to 20 percent. This means you could burn about 10-40 calories by laughing for 10 to 15 minutes. While this sounds good in theory, you’d have to laugh solidly for an hour or more for this calorie burning to have any meaningful effect. Research shows that couples who use laughter and smile when discussing a touchy subject feel better in the immediacy and report higher levels of satisfaction in their relationship. They also tend to stay together longer. "The occurrence of speaker laughter at the end of phrases suggests that a neurologically based process governs the placement of laughter in speech. Different brain regions are involved in the expression of cognitively oriented speech and the more emotion-laden vocalization of laughter." Comedians also use the natural tendency for laughter to grow and fade to their advantage, and will leave spaces at the end of a sentence for the audience to fill in with laughter. Research by Dr. Provine found that women laugh 126 percent more than men in cross-gender conversations, with men preferring to be the one prompting the laughter. In a review of more than 3,700 newspaper personal ads, Dr. Provine revealed that women were 62 percent more likely to mention laughter, including seeking a mate with a sense of humor, while men were more likely to offer humor in their ads. While there’s no one joke that makes everyone laugh, Professor Scott found that one of the best tools for making people laugh in her lab is a clip of people trying not to laugh in a situation where it would be highly inappropriate to do so. Children laugh easily and often, but adults may forget to make room for laughter in their daily lives. If you can, incorporate laughter into your daily routine by finding what makes you laugh. Remember that you’re more likely to laugh in the company of others, so try to find the humor in life when you’re spending time with friends, family, and co-workers.